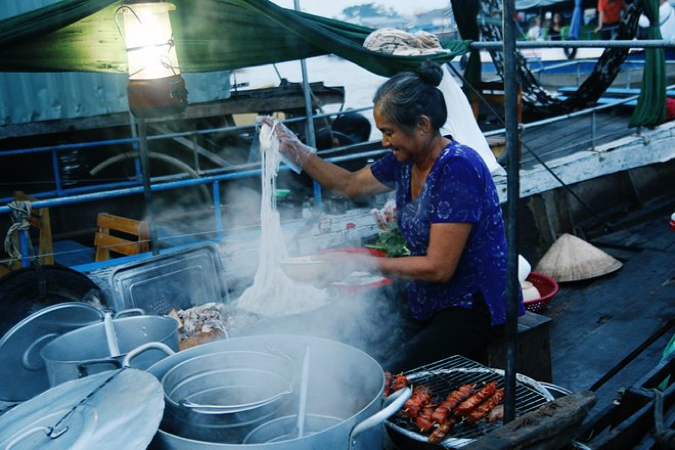 Cai Be floating market is located in Cai Be district, Tien Giang province – on the giant Tien river (one of the two main streams of Cuu Long river). 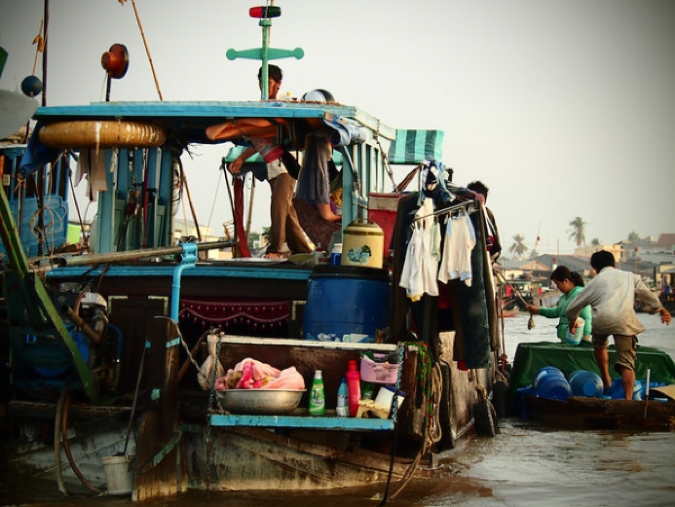 This is a hub for transporting goods, fruits and sea foods to and from the Mekong Delta and the rest of Vietnam. It remains a convenient choice for many foreign travelers due to its short distance from Ho Chi Minh city. 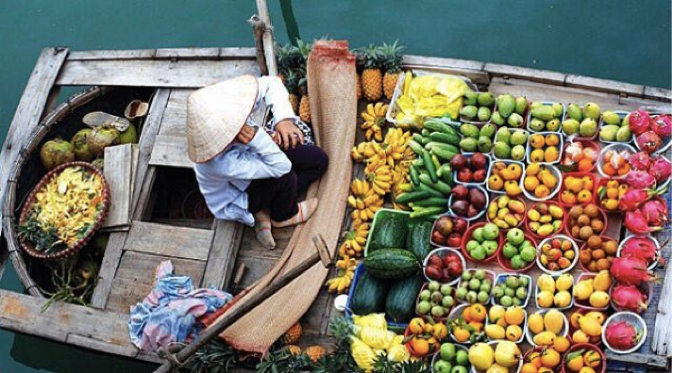 Unlike other floating markets in Vietnam which start early in the morning and therefore finish earlier, Cai Be market stays open until late, to accommodate for travelers who might not be as keen on mornings as the Vietnamese! Right from first moment of sunrise, boats start gathering and kicking off their daily trading activities. Location: Cai Be province is only about 80km away from Ho Chi Minh; City driving along 1A highway. Transportation: You can book a private Cai Be floating market tour or taxis to go there from district 1. Once reaching Cai Be bridge, just ask local people, they are more than happy to show you the direction to the floating market. 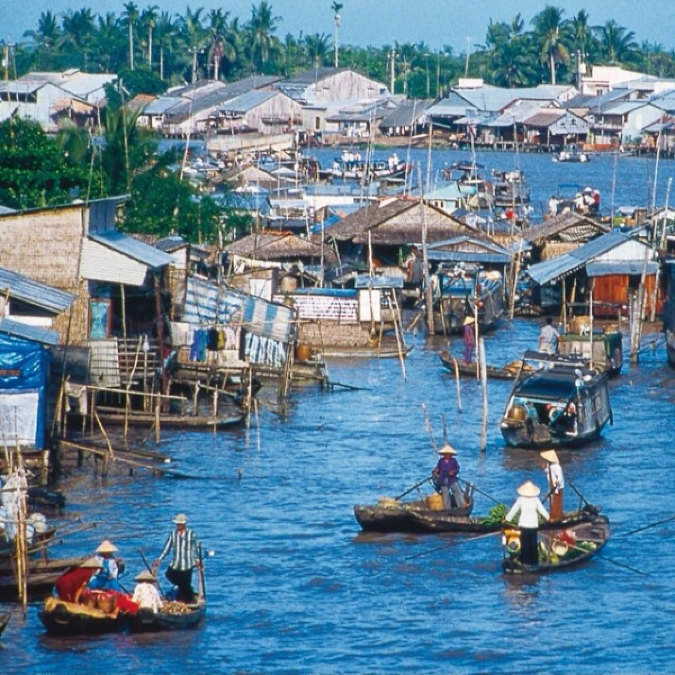 Don’t worry if the long distance from Ho Chi Minh city puts you off. Transportation: You can go to Can Tho by bus (it’s about 4 hours long). You can buy ticket at Phuong Trang bus office at 272 De Tham, District 1 or book online via https://futabus.vn. The one way ticket costs about $5.5 and departs every 4-5 hours per day. Once you are in Can Tho, you can hire a private car or taxis to take you to Nga Bay province (about 30km from city center). 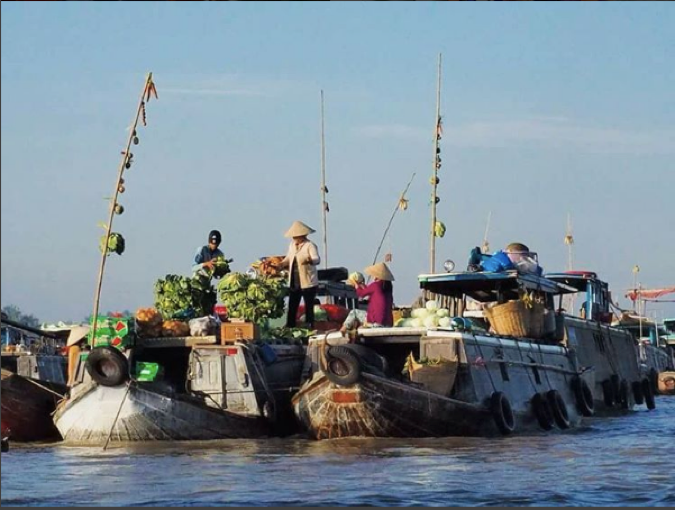 Cai Rang floating market is a big wholesale market and the must see place for travelers when they visit Can Tho. The market starts at 5am and becomes crowded at 6am. Cai Rang is famous for being the largest fruit selling hub, specialising in exotic fruits such as Nam Roi grapefruit, Ving Long pink kiwi kumquat or Cai Mon durian. Similar to other floating markets, produce from the local area are hung on top of a long bar to showcase and attract customers. 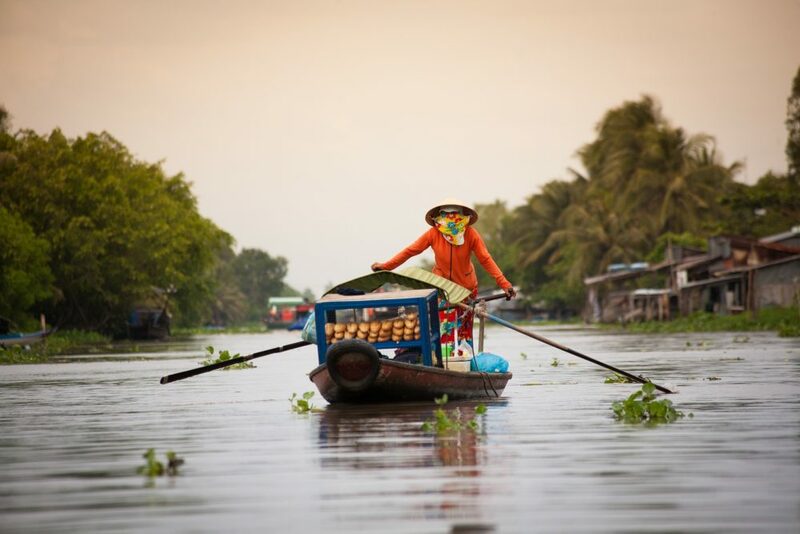 Long Xuyen floating market is a hidden gem, this market is one of the less popular floating markets in Vietnam, but definitely worth a try if you are in search of a place that gives off easy and genuine vibes of Mekong Delta’s people and nature. The most popular local produce sold here are veggies, pickles, squash, sweet potato, fruits and typical West-Southern snacks as fish rice noodle, pig-skinned pieces or salad roll. Surprisingly, you cannot find a single person bargaining here since the market mostly serves local people and hardly commercialised. 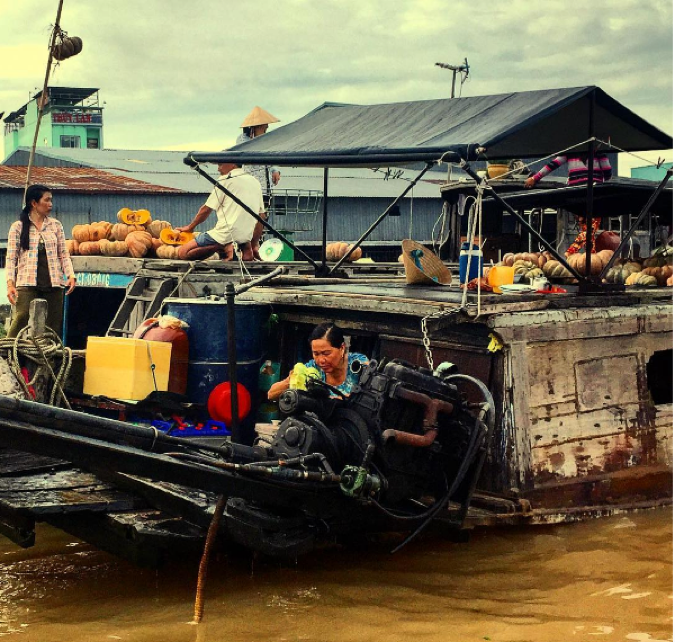 how to get to those floating markets from ho chi minh city? I am finding a private tour last 2 days to travel around floating markets. My experience: If you want to have best experience, avoid touristy boats. Take a local fishing boat. 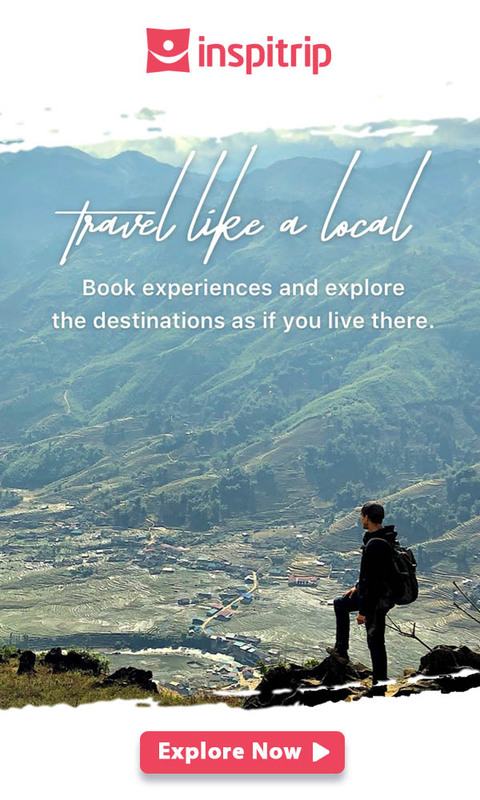 You’ll have more flexibility this way and the local will show you around. I looooved the floating market! Vi was our first experience with Inspitrip and it was a really good one. Everything was perfectly arranged. And with perfectly I mean that the driver would exactly arrive at the moment we got to the road, so 0 waiting time. She’s also very nice to chat with and knows all the ins and outs about Vietnam and the Mekong Delta. My parents and I had a great day. I completely recommend Vi Tour for you Will experience the real local, intimate life!